Last year, that was the situation we found ourselves in — looking for social media software that could help us better track our key metrics. As your business and social media activity grows, what could have once been accomplished manually becomes unmanageable. What social networks are included? How many users can access the social media software? Can I access historical data, i.e. the data that existed before we started using the software? After doing myriad trials with companies including Sprout Social, Quintly, Simply Measured, Datapine and Nuvi, I’ve rounded up the answers. 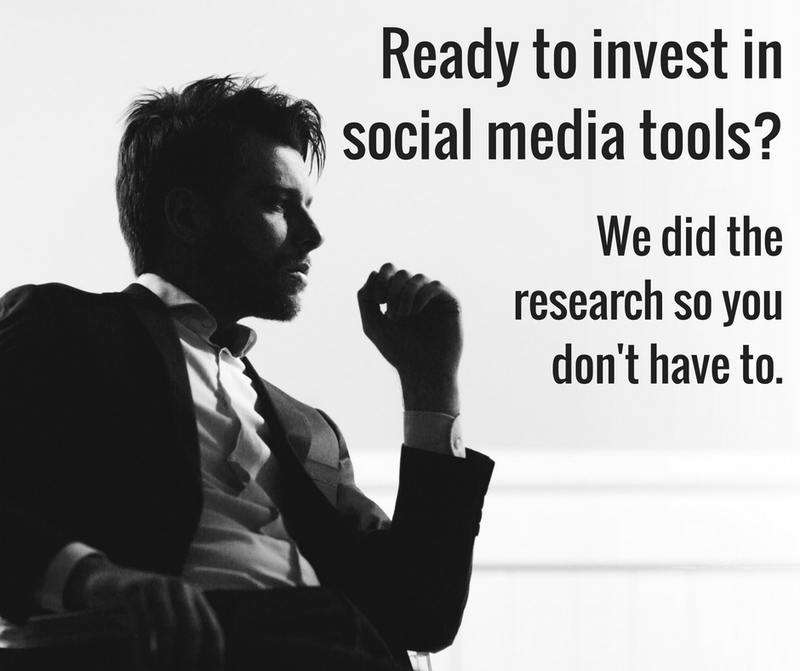 I want to share my research with other brands, businesses and agencies so that you’re ahead of the game when you start looking for the social media tools that are right for your company. Here’s a quick overview of some of the major points of consideration. Social media marketing tool platforms can range in price from $50 to $1,600 per month. Fifty dollars, however, is on the very low end, and such an account is very limited. Along with the big variance in cost is a big variance in tool features. Sprout Social, for example, offers a “deluxe package” for $59 per month that allows for one user with five accounts. Publishing from the platform is available, as is a limited number of reports. Google Analytics is not integrated and white labeling is not available. If you’re a small business or individual looking to track the most basic social media marketing KPIs of follower growth and mentions using a single dashboard, this could be the solution that works for you. No contract is required and you pay monthly. One user and five accounts, however, is not going to be enough for an agency or larger business. For robust social media software the average price is $500 per month. At this level, the software is apt to include advanced social listening reports, competitive reports, hashtag tracking and research tools. Nuvi, for example, can algorithmically determine (with 82 percent accuracy) whether your brand is being mentioned in positive or negative way. Consider a brand like Coca Cola, for example, with thousands of tweets mentioning them daily. The advanced social listening report is a lifesaver. With Nuvi, the social media manager can set up an alert if the brand’s messages reach a certain threshold of negative mentions. She can set the threshold, and then she can set up a text alert so she’s immediately made aware when this happens. Looking again at Sprout Social, moving up to the “team package” allows you to monitor 30 social media profiles and have three user logins. The team package also includes a message approval workflow (i.e. an associate could craft messages and later, a manager approve and push them out) and advanced reports. The team package is also integrated with Google Analytics and white labeling is available (a key feature for an agency). If your business is a non-profit, you can usually get a discount on these rates. Most likely. All social media software I researched necessitated a year-long contract, paid monthly, except for Sprout Social and Quintly. Sometimes. After testing the tools and looking at the reports they generated, the ones that were integrated with Google Analytics provided nothing that I couldn’t obtain in the Google Analytics Social Referrer Report — so the fact that I need to look in two separate data platforms isn’t really a deal breaker. This varies by tool, but you should at minimum expect Twitter and Facebook. Simply Measured includes Twitter, Facebook, Pinterest, YouTube, LinkedIn, Tumblr, Google+, Instagram and Vine. Sprout Social, on the other hand, only includes Twitter, Facebook, Instagram and Google+. How Many Users Can Access the Social Media Tools? This also varies. At the low end of the price spectrum, there’s only one user allowed access. The more you’re spending, though, the more users you’re allowed. This isn’t something you should expect. The only social media software I found that offered this was Nuvi, and even then, Nuvi could only provide historical data for Twitter and it costs an extra $300 per month. Sometimes. Again, with accounts on the lower end of the price spectrum, it’s not included. Even at a mid-level account, such as Nuvi’s cheapest package at $600/month, white labeling does not come standard. It costs an extra $300 a month. Quintly and Simply Measured don’t offer white labeling at all. I recently presented this research at SocialPro 2016 in Seattle. If you’re into slide decks instead of articles, feel free to enjoy this one. What’s your preferred social media software? Share your thoughts in the comments. Hi Jagdish. Thanks for your interest in Kristi’s social media tracking spreadsheet template. Is info[at]webdesignhub.in the email address you want it sent to? Can I get the social media tracking spreadsheet as well? Thanks, Kristi. I’ll check that. This question … where do I even begin? This is dishonest and unethical. YES, Ponju, you would need to prove you’re a nonprofit. And NO, Ponju, there is no reason you should ever be taking advantage of a company’s discount for nonprofits. It feels bad when investing a lot of amounts while investing in social media and it won’t work well. Thanks for sharing such a relevant and useful content with us. Could you please share your Free social media tracking template link. I’d love to use it for few days. Well, that would be amazing if that was how it worked, BUT automation is not nearly as valuable as hands-on, strategy. The goal of social media marketing is to REALLY connect with your audience. Meet them where they’re at and provide valuable content to them, whatever the platform is. Automation, on the other hand, only works in small doses. For example, the only automated social media our agency has set up are Twitter feeds that automatically tweet updates from the Google Blog, Yahoo Blog, Marketing Day and Search Engine Land — and that’s because we feel those tweets will be valuable to our audience. off course social media software will give us thousand of likes by distributing our content and post to millions of user. Purchasing social media software is an good idea. It depends. If you’re an agency with many accounts to manage, or a major brand with too much activity to track manually, the cost begins to be justifiable. If you’re a smaller operation, it would be better to start with one of the less expensive tools. As far as ROI, it simply depends. Organic social media is not usually a monetized conversion, but it can often be part of the conversion funnel. Social media marketing also has tremendous value for other things, like PR, branding, buzz, authenticity and trust building. Great Post, But Very Costly what should be the ROI ? What tools did you invest in John? Thanks Kristi for nice post! My firm spend about $500 for social media tools. It really cost a lot! Using an automated social tool is totally necessary to get any traction at scale with multiple accounts and multiple niches. But I’m wondering how long this kind of content will be valued in comparison to organic active users. As an active user who interacts with a small number of accounts, it’s not hard to spot automated feeds and basically swipe past them looking for more human sources to interact with. I guess this is the challenge for content marketers using automation tools. What do you think? I hear you, Swapnil. But at least you can still access the social referrer report in Google Analytics! Its harsh that even after paying x amount one can’t integrate GA in social media tools. Though a limited budget like mine have to be satisfy with this only.